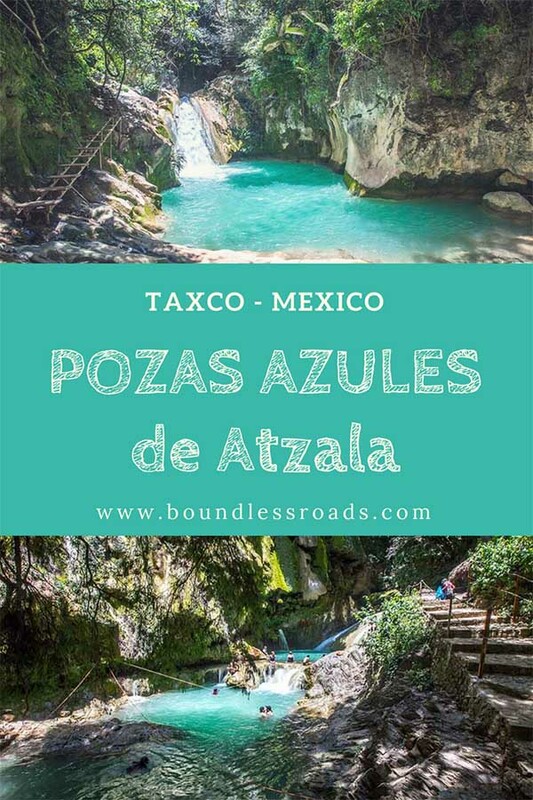 A little map to show you where Taxco and Pozas Azules are located within Mexico. 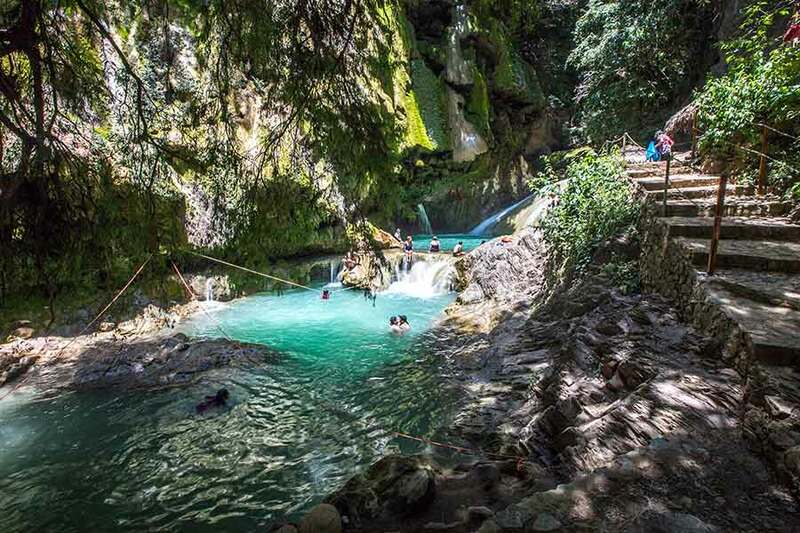 Pozas Azules is a great refreshing natural attraction situated at only 40 minutes driving from Taxco de Alarcon, one of Pueblos Magicos in the Mexican state of Guerrero. 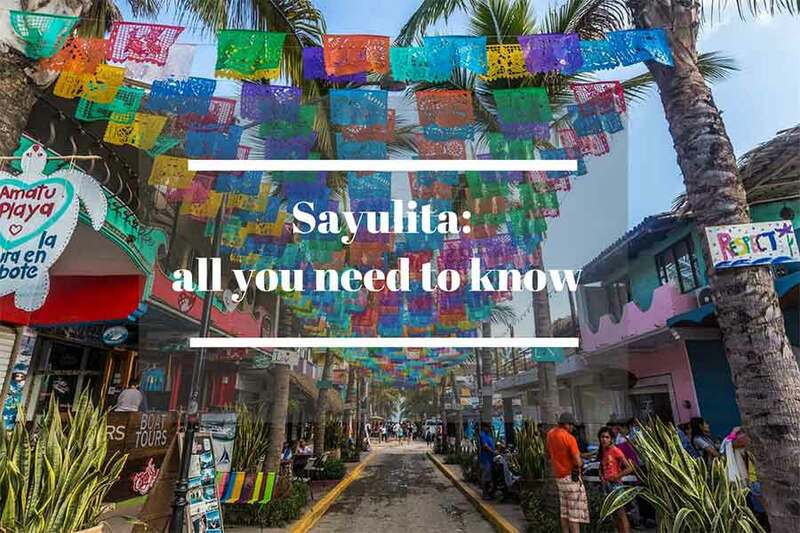 If you wish to know more about Taxco history and all the things you can do there you can check out this fully exhaustive post. 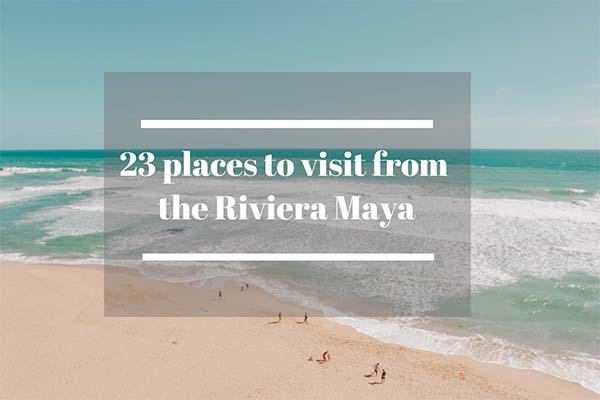 It was my first morning there and although I wanted to visit Taxco itself, my main focus was to explore the natural beauties in the surroundings, especially Pozas Azules de Atzala, the stunning blue waterfalls that I keep seeing Instagram. 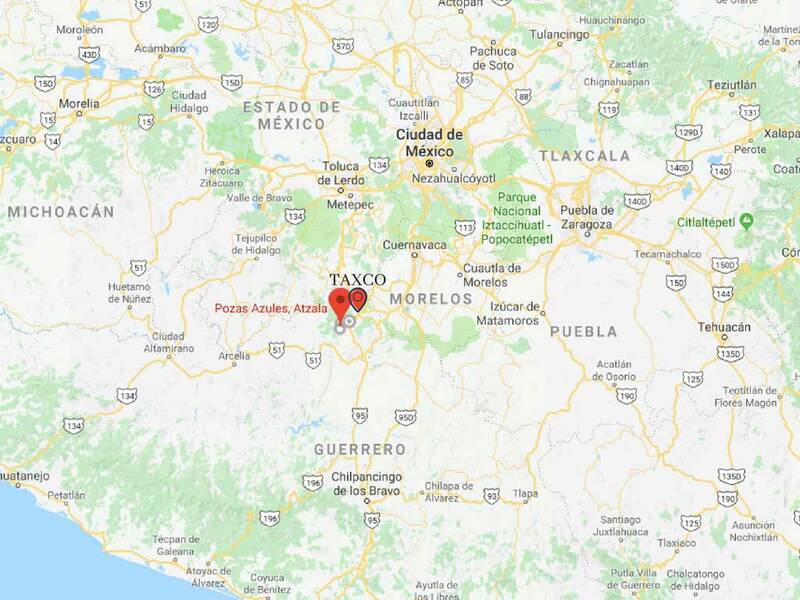 Therefore, after walking around the market for a little while, I head to the Zocalo of Taxco (the main square) in search for breakfast and also looking for tips on how to get to my special place. In a couple of minutes, I found what I was looking for. An excellent breakfast at the café Punta del Cielo, situated on the main square, where I have also asked my kind waiter how to get to Pozas Azules and he gave me precise directions. Therefore after my delicious muffin and espresso coffee – you know, I am still Italian – Off I went towards my ride to the falls. You have to walk down to the main road close to the bus station but further down (Acapulco direction) in front of a big shop called Coppel. 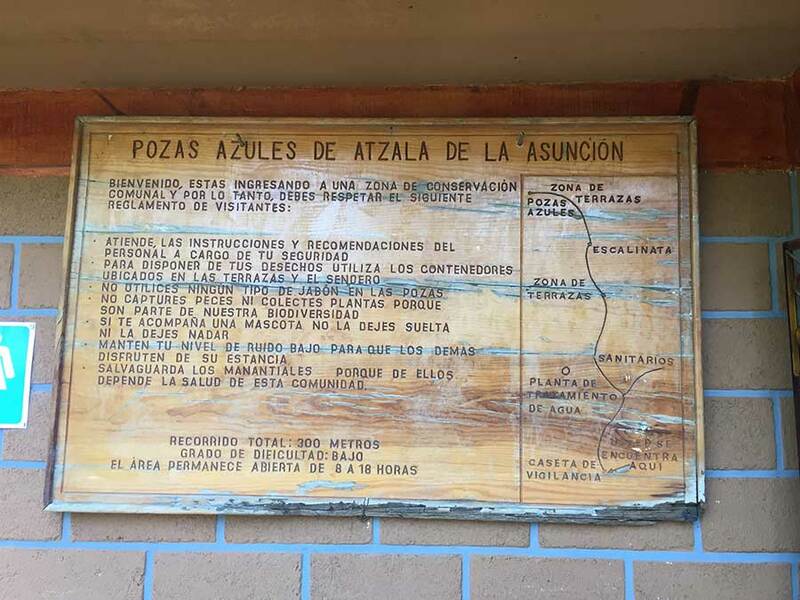 Right there on that side of the road, you will find the small busses (minivan or combi or peceras) to Pozas Azules leaving after half an hour. I took the one at 12. I guess If you go much earlier, around 8.30 you will definitely find fewer people. The bus will take you right in front of the entrance of the waterfalls. At the same point, you will find another bus to go back still every half an hour the last one is at 7 pm. 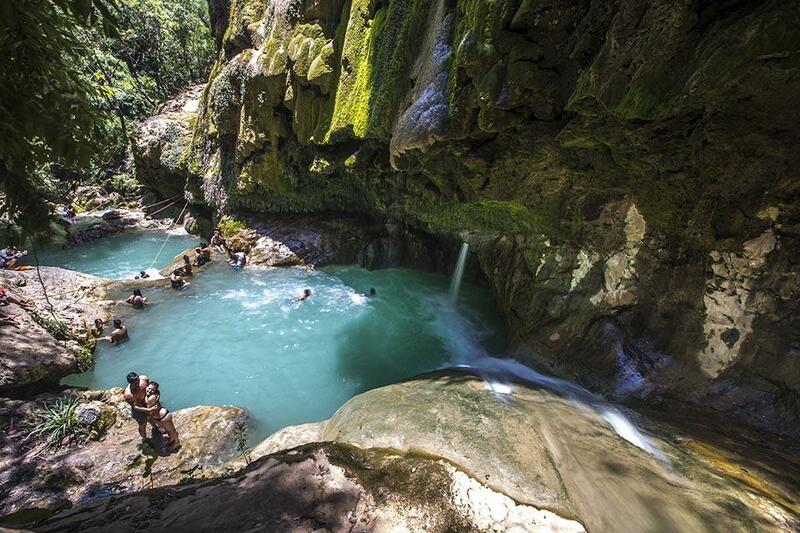 There are not many activities to do if not enjoying the beautiful crystalline waters. The only problem comes only when there are tones of noisy people with all their rights to jump shout and having fun in their own way. However, in case you love peace and tranquility, there is a way to find it. I am telling you how here below in the next chapter. At the entrance they also give you some common sense rules that help to protect the environment, you will also see a sign with the map and some practical information. They will also tell you that there are 16 pools in total but only 8 are accessible. At the time I was there, only 2 pools were open to the public which disappointed me as I wanted to see more of it. 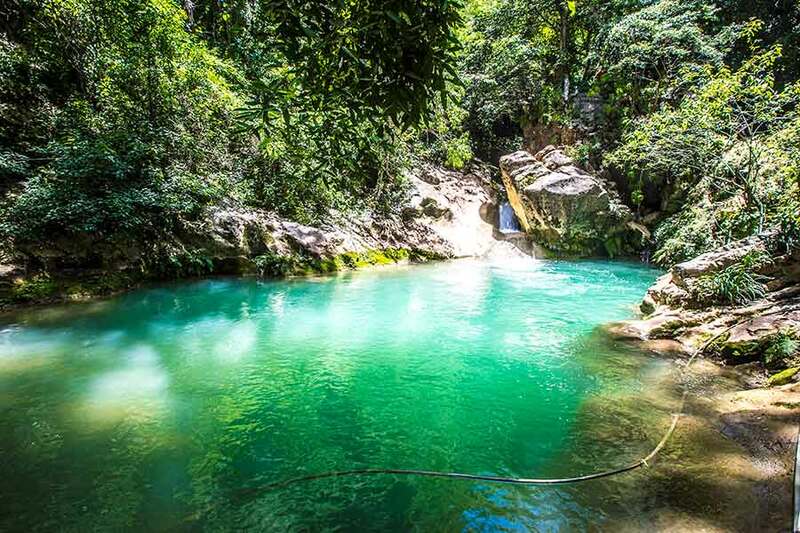 The guides kindly explained that it was being low season and I realized that probably they cannot afford enough security staff to watch over all the pools. 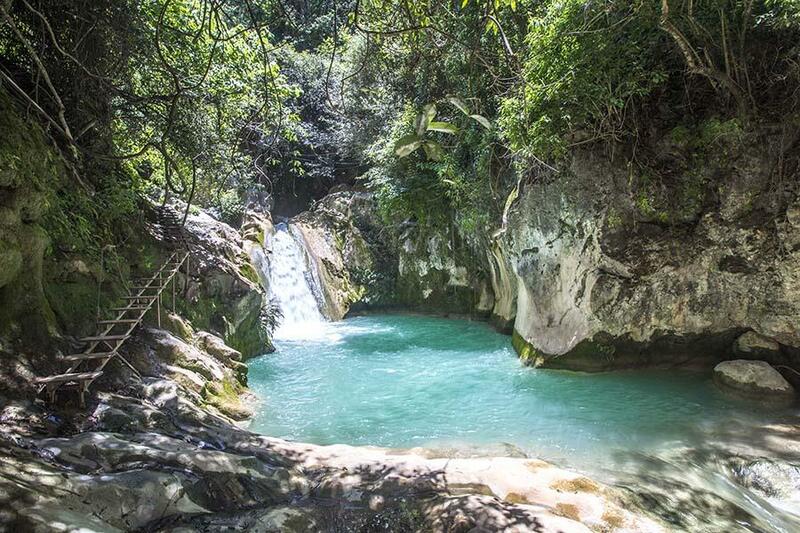 When they noticed my disappointment they suggested that I could hire a guide to take me on a short hike to see the other falls. They don’t have a fixed rate. You just tip the guide as you feel. I told them I would check it out and then decide. The way to the first two pool is a very easy walk on a man-made wooden path through the jungle. It takes about 5 to 10 minutes. Once I arrived at the actual pools I was a little disappointed to see soo many people and noise. I don’t want to sound snob but I love peace and quiet when I am in nature. Therefore after a couple of pictures, I ask for a guide to take me further up. They call a young boy who despite a very young age he looked very knowledgeable of the territory and very confident. 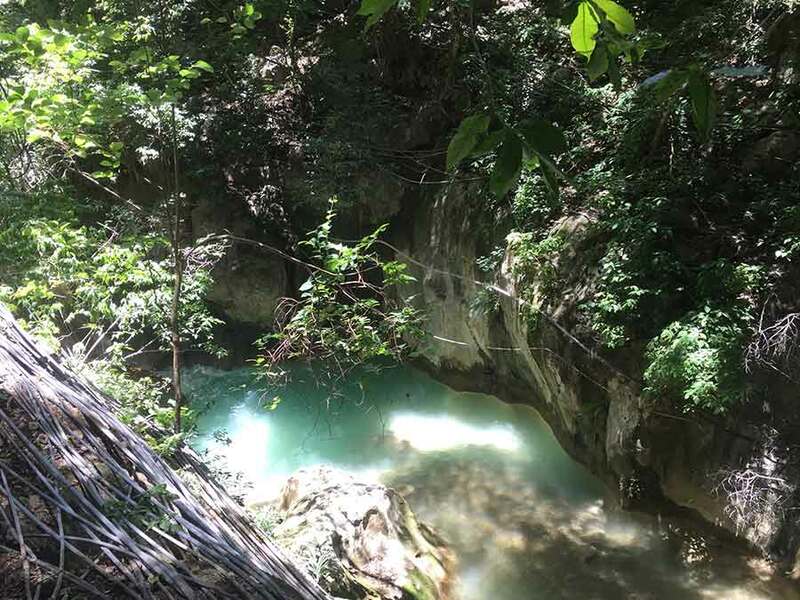 He would jump from one rock to the other as if it was so natural, while I was so careful and tense trying not to stumble and fall as clumsy as I am that would have been possible. So we tried another path below but after a few minutes walking I realized it was too slippery and steep, even more dangerous. So, following the suggestion of the guide, we went back to the original idea. The guide would hold my heavy burden, backpack, camera, and tripod so that I could worry only about jumping. Another guide would have helped us. I really felt so inept and graceless. We all laughed and I finally made it. I really appreciated the genuine kindness and help of the two guides. We arrived up at the last 8th pool. It was amazing. You can see it in the pictures. Nobody was there and I asked the guide if he didn’t mind waiting for me while I would have a quick swim. 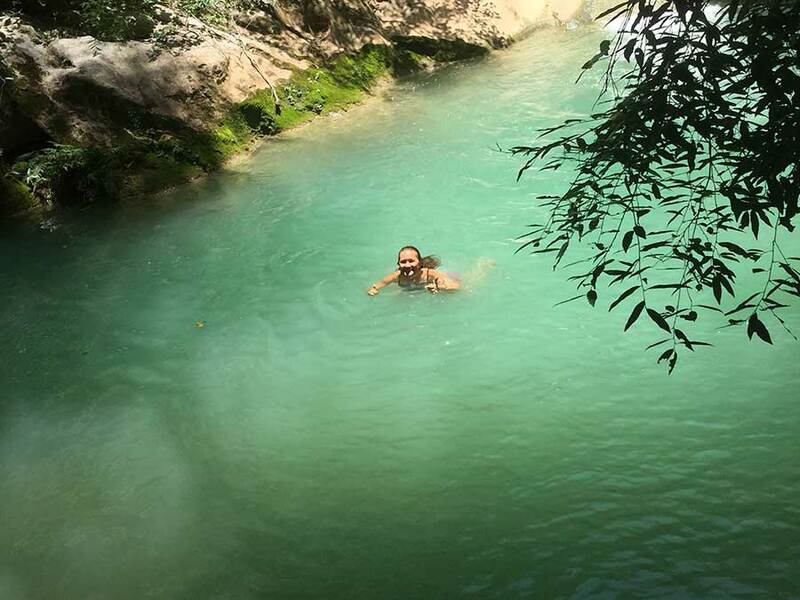 I could not leave without enjoying the sweet waters. He was really nice and accommodating and not only waited for me but offered to take pictures of me in the meantime. I enjoyed the water and the sound of silence for a few minutes and then we headed back. However, if you wish to stay longer I guess you can ask the guide to leave you there and get back to you later on. It’s not really far. They say you need a guide to get there because the path can be hidden and for safety reason of course. During our way back I kept my swimsuit on and I jumped also in the other two pools, so refreshing and, since I was there, why not! When we got to the same difficult point to cross ( difficult for me of course) I chose the easy way this time. As I was barefoot I just crossed the small stream of water by walking in it. The current was not that strong and the guide helped me to climb back up on the other side. It sounds difficult to explain in words, but it was easy to do, at least with the guide’s help. After getting changed in the rough changing rooms by the pools, I head back to the entrance and waited for the bus. 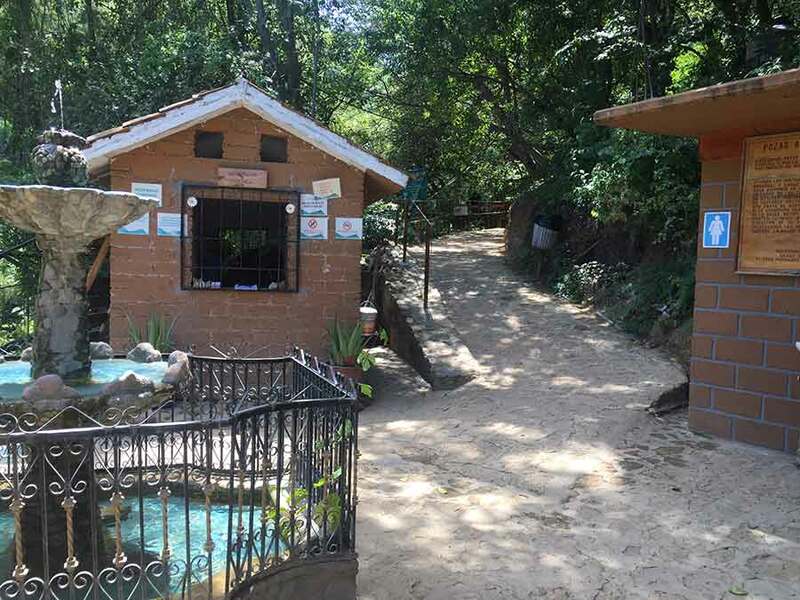 I was planning to go check out another waterfall that was halfway on the way back to Taxco. While waiting for the bus I met Sam, a young American tourist who was visiting from Mexico City. As we started to talk I found him very cool and offered him to go with me to check out the second waterfall. He accepted and I was happy to be able to share this adventure with somebody else. But I will tell you about it in another post. 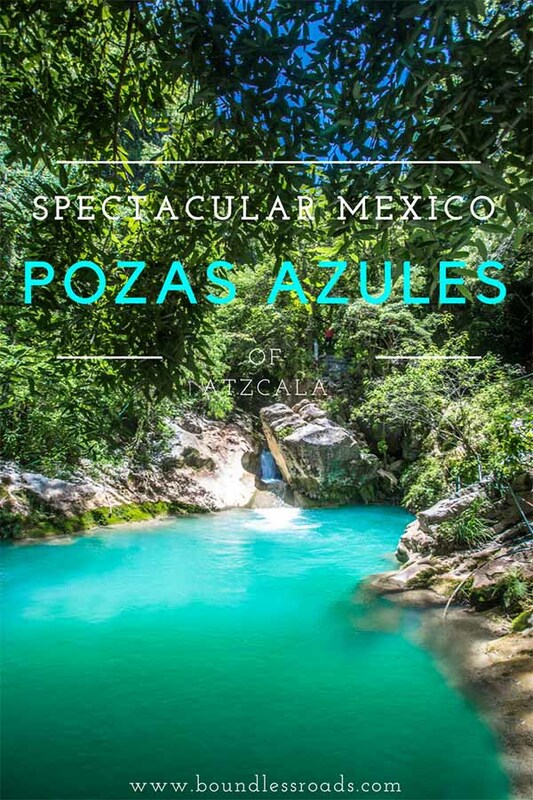 I hope you will enjoy visiting Pozas Azules and if you wish to tell me about your experience please feel free to write in the comments below. gym shoes if you wish to have the little hike to the others pool are recommended. throw your trash in the bins situated on the terraces and the path. 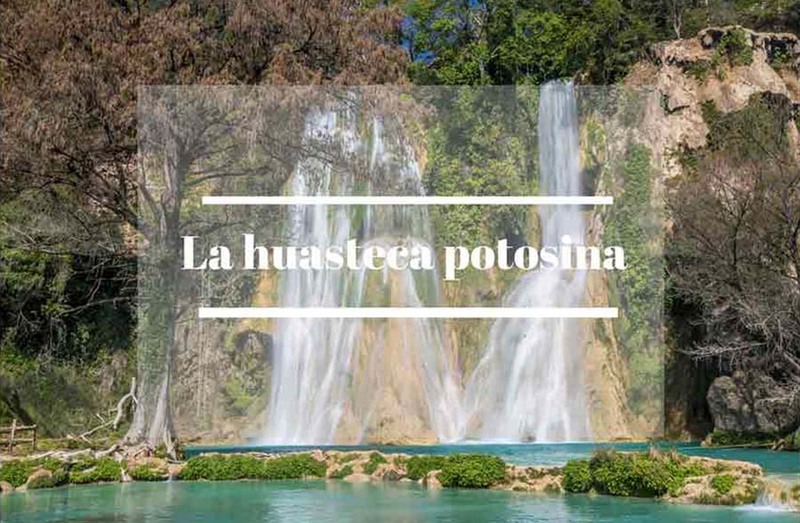 don’t capture fiches or any tope of plants because they are part of the biodiversity and you would destroy it. if you bring your pets, keep her/him on the leash and don’t allow her/him to swim. try to keep any sort of noise as low as possible to respect others’ peace and tranquillity. 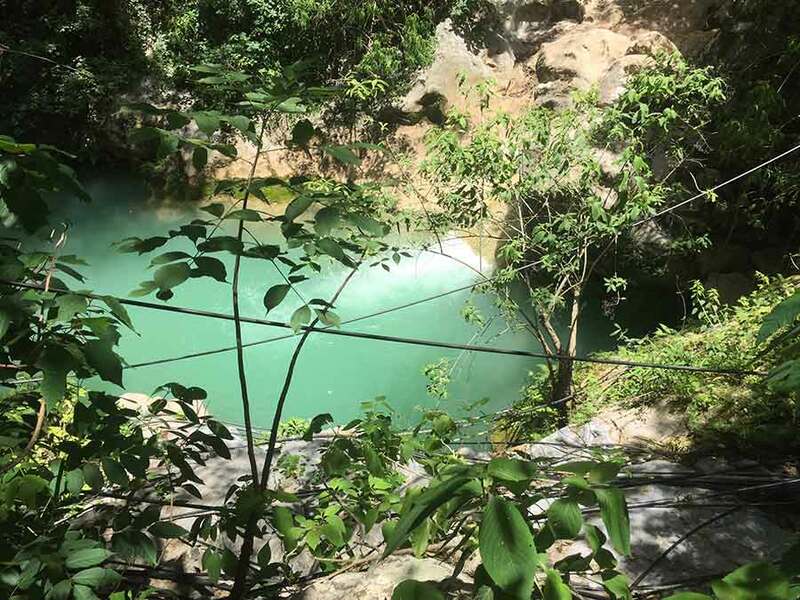 do not do anything to damage the pools as these are the natural resources, which the wellbeing of the surrounding community depends on.